Baby tenders existed for two reasons: to give parents time without the infant and to ensure the baby’s safety whilst the parents were away. The most dangerous part of a colonial home was the open hearth. Necessary for both warmth and the “one-pot meals” that characterized early American family eating, the open hearth was an essential, yet simultaneously lethal, aspect of early American homes. 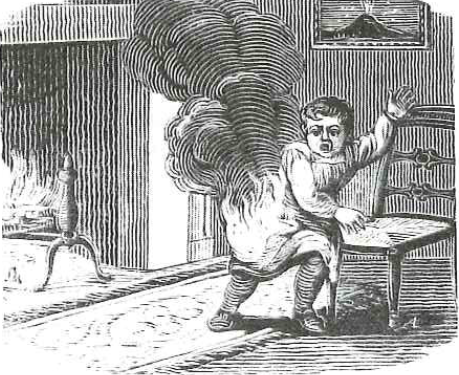 Children were routinely injured, and sometimes died as a result of burns. 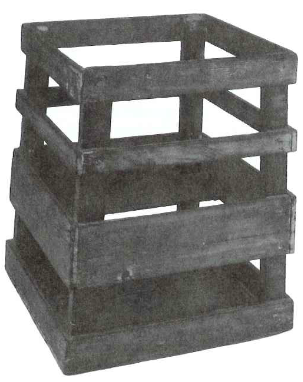 But the reason that we didn’t initially guess that the crate above was for babies had nothing to do with the dimensions of the crate or a misunderstanding of the dangers of fire. 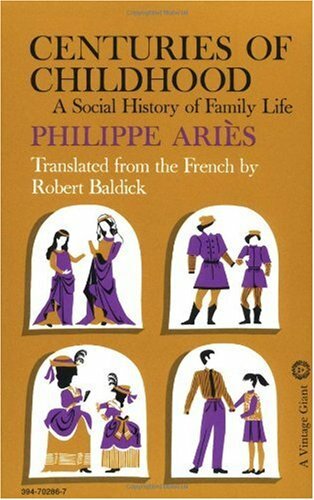 Rather, it had to do with a fundamentally different understanding of children. Today, we simply “see” children differently than they did in colonial America. If you’re anything like me, feeling as though anyone could look at an infant and feel anything other than love, affection, and a strange desire to nuzzle those chubby little cheeks seems almost impossible. Yet, these feelings and desires are actually part of a larger ideological shift in cultural conceptualizations of childhood. And this shift had architectural implications–ones that were slower to come about. Though ideologies regarding children shifted, home architecture was–perhaps understandably–slow to adapt (I posted on this issue in more recent history here). Homes were not instantly equipped with nurseries and the safety equipment and devices seen as necessary for households today. Rather, these things slowly emerged as an understanding of the necessity of spaces and rooms designed for children in the home gradually took hold. Baby tenders and the like were still used, even as these items might have started to acquire new meanings. The famous behaviorist BF Skinner even claims to have used a baby tender, and though it’s tempting to joke that he put his child in one of his famous Skinner boxes, this is not how he describes it at all (here). In fact, he talked about his baby tender in a way that illustrates this shift. Skinner’s comments illustrate the change in understanding children as not only in danger, but as the “innocent” and “vulnerable” beings Mintz describes above. In the early 1900s, families living in the city (and increasing numbers of American families were moving to urban settings) faced a new set of dilemmas. 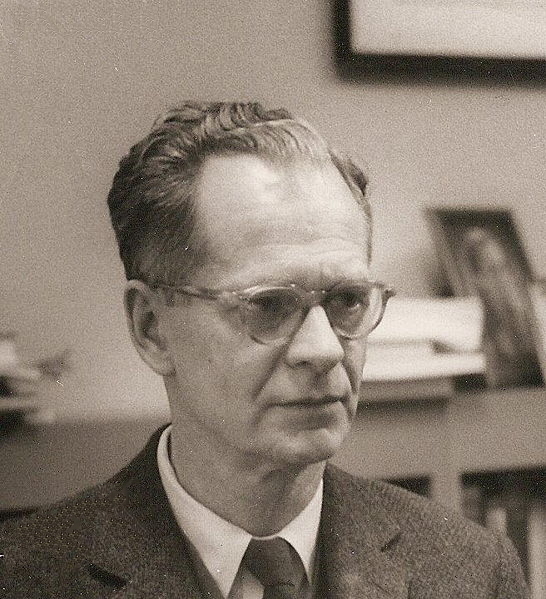 Like Skinner, and prior to his parenting experiences, families faced new conceptualizations of children’s “needs,” and of the consequences of not fulfilling them. But homes were not necessarily immediately well-equipped to help parents fulfill these needs. And families living in urban highrises struggled in historically new ways. 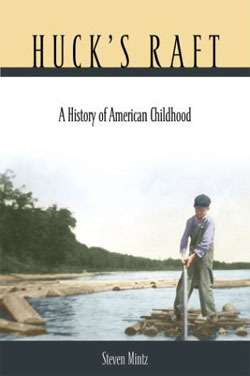 They moved to the city as industrialization quickly called them in, but came during a period in which ideas and ideals surrounding childhood were transforming. Fewer people–now primarily women–became completely responsible for children, but they were also burdened by new requirements in domestic upkeep. This was part of the process through which the “cult of domesticity” became established. Just as we started understanding babies as requiring more time, affection, and attention, fewer people were present to help provide it–or understood as responsible for it. 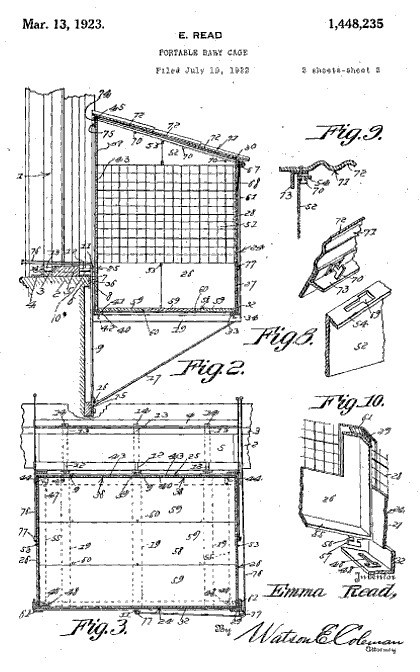 By 1922, this prompted an industrious young American, Emma Read, to patent a device–the “portable baby cage”–that helped bridge the gap between “modern” conceptualizations of childhood and transformations in home architecture. 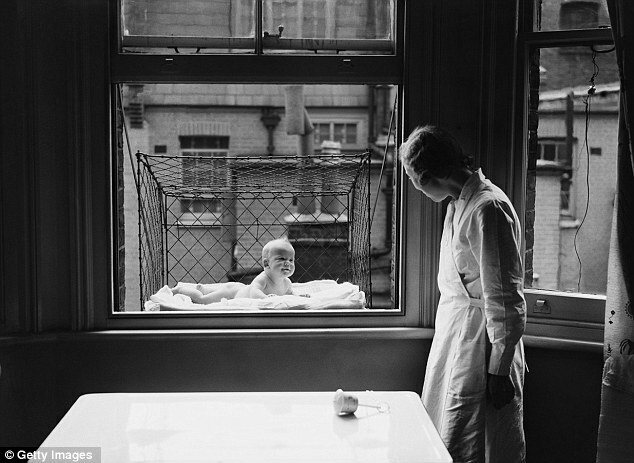 Pictures of baby cages in London were made popular by an Atlantic article. These cages are so odd by contemporary standards because our conceptualization of childhood has more completely transformed. While the item was referred to as a “cage”–in some ways, not so different from colonial baby tenders–they are discussed in ways that illustrate changes in how babies were understood. While Read is preoccupied with managing to get “fresh air” to children in her evaluation of the importance of the “baby cage” (a preoccupation with the circulation of fresh air was something that plagued Victorian architects as well), the cage accomplished something else as well. 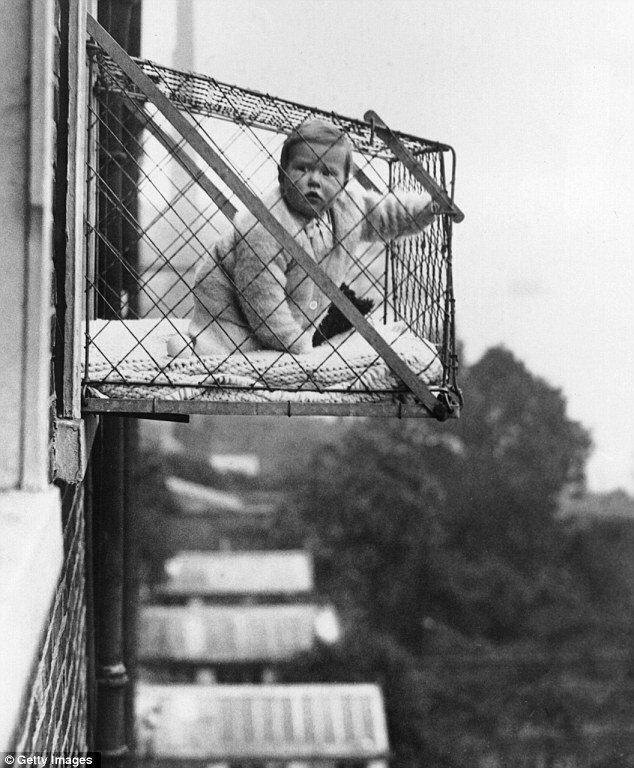 Baby cages also quite literally extended the boundaries of the home’s “interior” in ways that allowed city dwellers to find space for the baby. Baby cages are a really interesting solution to the lack of architectural and social provisions seen as newly necessary for children, and are an illustration of the transformation of cultural conceptualizations of childhood. For instance, Emma Read seems unconcerned in her patent with ensuring that adults receive fresh air. This is because Read understood children’s and adult’s needs as distinct–and this belief is an essential piece of the cultural transformation in our understandings of children and childhood. Thanks to Matthew Martin for the images of the early American baby tender and the lithograph of the child on fire. 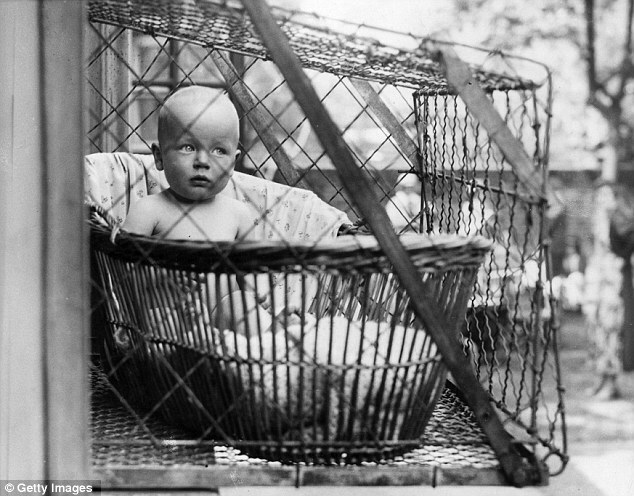 Thanks to Joseph Fusani for forwarding a story on London’s early 20th baby cages. This entry was posted in Gender/Sexuality and Household Space, Historicizing Issues of Gender and Space, Space (Abstractly Defined) and tagged baby cage, baby tender, chidren, childhood, dangers of the open hearth, Emma Read, philippe aries, social construction of childhood, steven mintz, vivianna zelizer. Bookmark the permalink. ← “Dear Abby”–A Space for Political Protest? OMG! That one picture totally freaked me out. I can’t imagine hanging a baby out a window by a small cage like that. How sturdy is that cage? It looks like a small push could send the cage and baby to certain doom. I agree. The images are almost unbelievable. It’s a terrifying prospect. The design diagram illustrates some of the “safety” mechanisms devised to ensure that baby cages did not come loose. Even more unbelievable than this however are some design features I didn’t mention. In some of the images (and specifically in the design), you can see that the “roof” of the cage is slanted. Apparently, this design feature would have enabled you to put something up there to collect rain or snow so that children might still get fresh air in bad weather. I can’t imagine placing a child in one of those things at all–let alone in a snow storm (and I’m guessing most people that used them wouldn’t have thought it wise either). this is fascinating. and disturbing. thanks for another great post! Urban infants were very prone to rickets – so this sort of thing might actually be rather beneficial for the health of babies. The middle picture (where you see a woman looking at the baby on a soft mat and the baby smiling back) makes me think these are not very different to the sort of contraptions we hold babies in now. I imagine they had a lot more wiggle room in their than in a car-seat. In response to Charlotte’s post: It’s my understanding that it is quite common on Scandinavian countries to let babies get fresh air by napping on the front walk in their prams. It’s considered quite safe and, apparently, no one bats an eye. The reason we gave her so much grief was that the golf course was on the other side of town. She just left him there alone, and took off for a couple of hours — although, we are all a sturdy and self-reliant lot, so there’s that. Except for the issue of safety, ( which I can’t judge on ) I don’t see why people are so shocked seeing these pictures. In the pictures in this article, those babies can at least breathe fresh air like they say and, even more importantly, look at a lot of things that happen outside! Babies who are born in our time spend a lot of baby time in their cribs as well, but they can only see some stupid baby mobile that in some rare cases can sing..and this is it. I actually find it a better solution than a playpen. When my daughter was a baby I would put her in front of the window ( offcourse the window was closed and she couldn’t fall) and she would look outside for long periods of time and I would be able to do other things as well. But she would never want to stay in her playpen, which would bore her so much she started yelling and crying. The ladies in these pictures had a lot more chores to do than mothers nowadays, I can understand the need for it. And who sais that they would leave their kids there when it would snow or rain? The picture with the mom looking at her baby while doing her chores I find very telling. The baby would still be in contact with her, but with the world as well. Babies nowadays can only wait for their mothers to come and play with them. Why is it so much better to leave a child in a crib than to leave it outside in a safe -offcourse I stress of safe here- ”cage-like contraption” ? Is the outside so scary? I’m not sure how much has changed. These items just sound and look like less aesthetically and semantically pleasing “play pens”.